FOXBORO, Mass. – It wasn’t the wide open, free flowing game that some expected, but it was still a hard fought game between rivals Franklin and Mansfield that resulted in a tie that left both sides satisfied with a point. The Panthers and Hornets were the top two teams in the Kelley-Rex division entering the contest, with Franklin holding a one point lead at the midway point of league play. After skating a 2-2 at Foxboro Sports Center, Franklin remains a point ahead in the division with three games left. 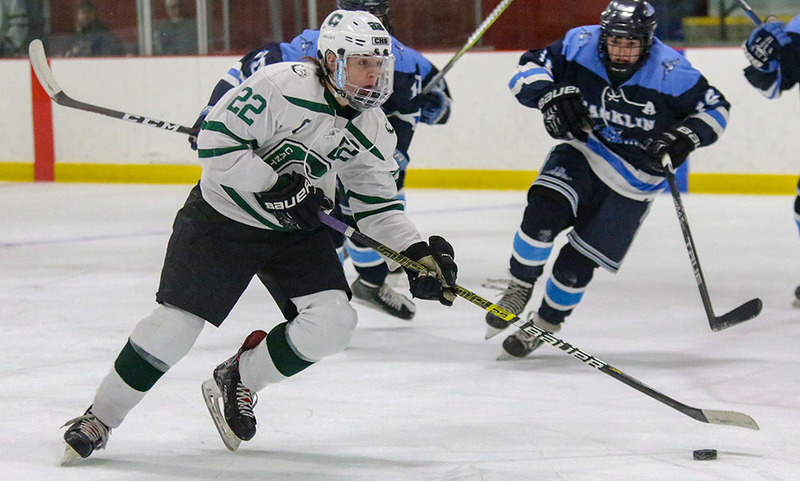 Franklin had a pair of one-goal leads in the game but Mansfield was able to respond each time, the game-tying goal coming early in the final period after the Hornets entered the frame facing a one-goal deficit. Long time Franklin head coach Chris Spillane was fine with the point as well, considering the Panthers’ overall record and need of points. Both teams created chances in the opening period but only about half were shots on goal, a stat that the Panthers led 9-7 after 15 minutes. 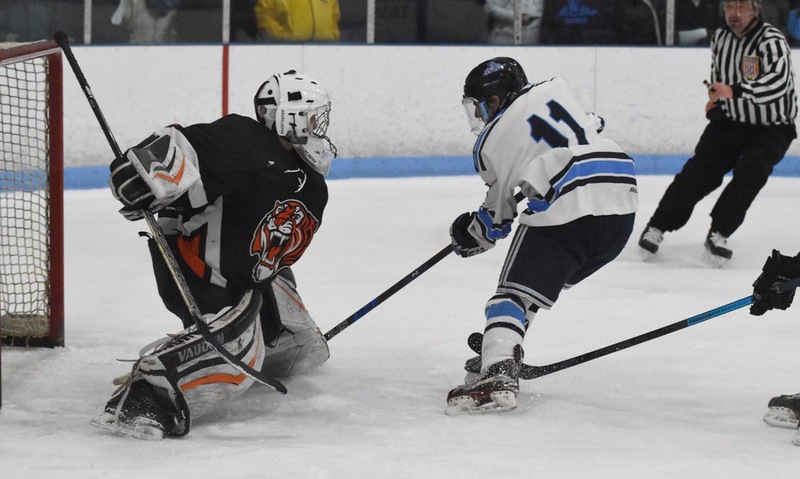 An early Panther power play resulted in just one shot on goal, a wrist shot from junior Shane McCaffrey that was turned aside by Mansfield junior Sean McCafferty (34 saves). Mansfield senior Coleman O’Brien helped kill off the penalty with a head first dive to block a shot. After the power play, Franklin’s CJ Spillane redirected a shot from Declan Lovett but McCafferty stood tall in net, and repeated that against Joe Lizotte and McCaffrey again in a minute span. Mansfield nearly cashed in on a home run pass in the final minute when Brad Grant found Jack Garland as he entered the attacking zone but his backhand attempt was gobbled up by Franklin goalie Ryan Cameron (30 saves). Mansfield sophomore Matty Copponi had a partial break in the final seconds but saw his wrist shot go over the bar. While there were fewer chances in the second period, there were more goals. The teams combined to score three goals inside of a three minute span during the second period. Before the opening goal, Mansfield had the best chance of the game just minutes into the middle stanza. Grant hooked up with Garland again, this time on a pass off the sideboards, and Garland ripped a wrist shot that clanked off the cross bar and went out of play. “It’s a big game, there were some nerves,” Balzarini said. “There were some guys probably holding the stick a little too tight, making passes they don’t usually make. But as the game progressed, I thought we got better. Just over six minutes into the middle period is when the visitors were able to break the scoreless tie. Franklin forced a turnover near the blue line and senior Scott Elliott took possession of the puck and darted toward goal. With the defenseman committed to him, Elliott dished the puck across the crease to classmate Dan Magazu for the one-timer and a 1-0 lead. The lead lasted less than two minutes as the Hornets took advantage of their second power play of the game. 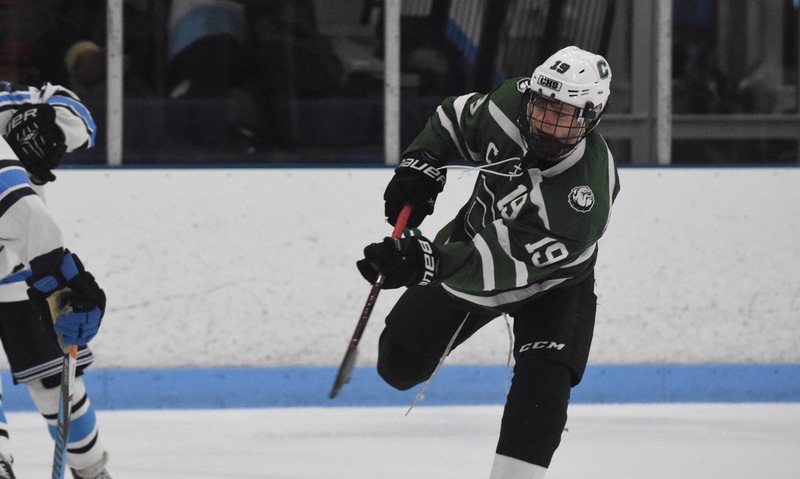 Senior Jake Lund stepped into a hard slap shot just over the blue line and the puck found its way through traffic, with the help of O’Brien screening in front, and into the back of the net. But before the Hornets could enjoy being level in the game, Franklin senior Joey Lizotte deposited the go-ahead goal just one minute later, with assists going to Zac Falvey and Cam Cassella. Mansfield scored the tying goal with its first real chance of the third period. Garland forced a Franklin turnover right in front of goal and quickly unleashed a wrist shot under the bar from the slot to make it 2-2. Both teams had chances over the final 10 minutes but couldn’t convert. Matt D’Errico ripped a shot for Franklin that was redirected by Magazu but McCafferty was in position for the stop. A minute later, Cassella whistled a shot that was tipped but again McCafferty tracked the puck and knocked it down. The best chance fell to the stick of Lizotte, who used his speed to split a pair of Mansfield defenseman. He was able to get past both Hornets, faked forehand and went to his backhand but McCafferty tracked it the whole way and made a terrific sliding pad to preserve a point for the Hornets. 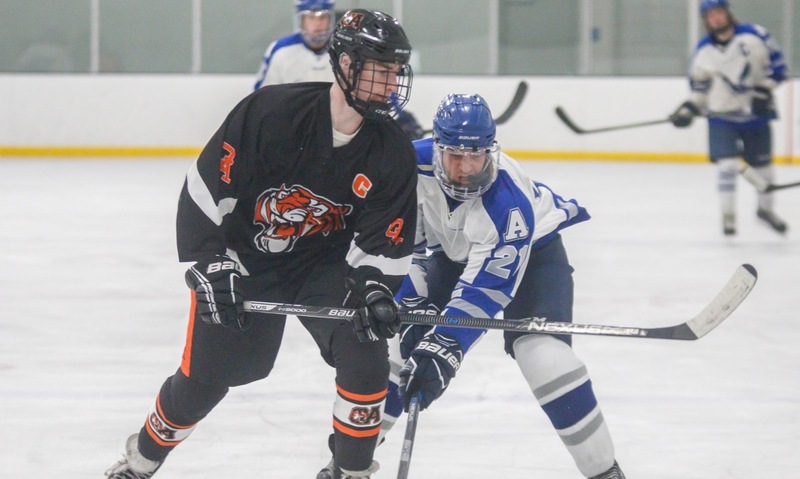 Franklin boys hockey (4-0-2 Hockomock, 5-4-4 overall) returns home for a big showdown with Davenport division leading and undefeated Canton for an 8:00 puck drop. 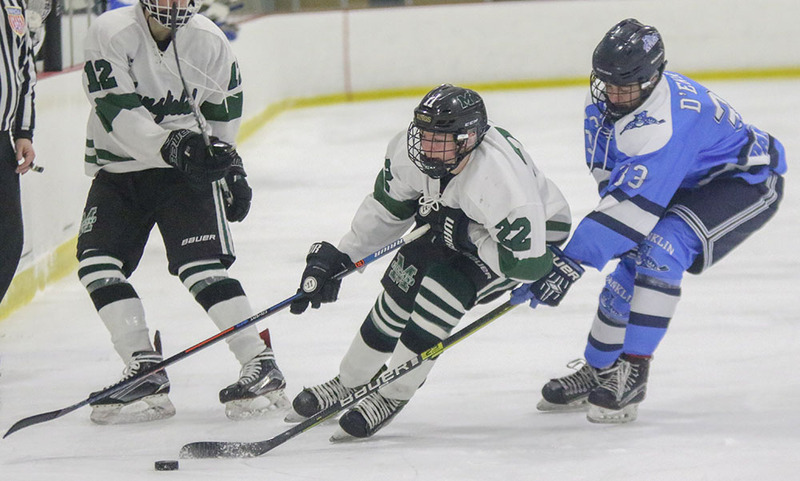 Mansfield boys hockey (4-1-1, 10-2-1) will host King Philip the same night at Foxboro Sports Center at 6:00.